Junior Bryant Robinson, No. 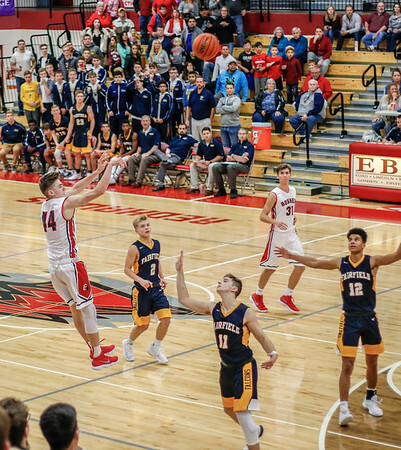 44, of the Goshen RedHawks launches the game-winning 3-pointer in a 44-43 high school boys basketball victory over the Fairfield Falcons Saturday night at Goshen. Fairfield defenders are No. 2 junior Payton Faldoe, No. 11 senior Luke Stephens and No. 12 junior Cordell Hofer. Also in the play is No. 31 senior Simon Myers of the RedHawks.